Create pedestrian precinct and drop off zone at Birdwood Avenue entry to the Shrine of Remembrance and Melbourne Gardens. Prepare detailed design to upgrade Kings Domain South post Metro tunnel works. Work with Royal Botanic Gardens Victoria to explore opportunities for collaboration in provision of visitor information and education services. Create new pedestrian entry and accessible path from the new Anzac Station to Birdwood Avenue. 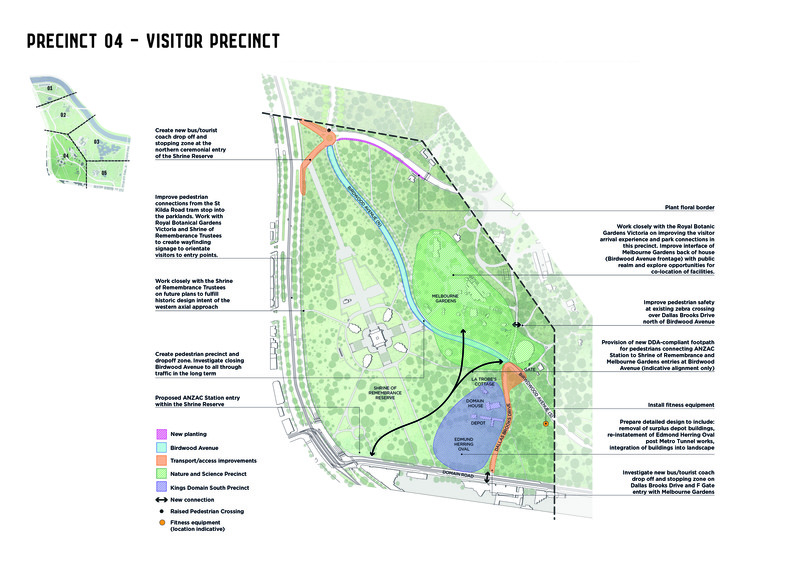 Improve pedestrian connections from St Kilda Road into the Domain Parklands.